It seems that every week, we hear some staggering figure or testimonial about one major threat to the transportation industry: the driver shortage. This story is not new; the industry has been warning of a driver shortage for more than a decade now, but just how bad has that shortage been in reality? Most of the time, shippers can still find capacity, and store shelves remain full. But that doesn’t mean the industry no longer has cause for concern. Below, we’ve examined the myths and looming threats of a shrinking driver workforce. Average driver pay hasn’t risen dramatically. Typically, high demand sends the price of labor soaring, but driver pay hasn’t kept pace with inflation let alone held carriers hostage. With some exceptions like Walmart, whose drivers command $80,000 per year, the average long-haul driver earns around $40,000. At about $19.36 per hour, that’s $2.00 less than the national average for hourly employees in production and other non-farm jobs. Some believe these low wages are the result of a decline in driver unions. Freight rates haven’t indicated a shortage. Rather than rising drastically, freight rates have ebbed and flowed with the economy. But even as online shopping has increased demand, shippers often don’t actually “feel” the driver shortage because they aren’t seeing an abundance of empty trucks or bare shelves in stores. Low fuel prices and competition have also put pressure on rates, keeping them close to those paid a decade ago. Baby Boomers have not exited—yet. The ATA predicted a shortage of 111,000 drivers by 2014 due in large part to an aging workforce. Today, more than 29 percent of truckers are between the age of 45 and 54 years old, with another 20 percent aged 55 to 64, and 6 percent over 65. In total, the shortage is currently about 48,000 drivers or 43 percent less than expected. Industry challenges are known and being addressed. Truckload turnover rates, recruitment costs, and tedious regulations have made hiring drivers more difficult, but these are not new issues. Although turnover rates can reach 100 percent, most carriers have already made aggressive recruiting, rigorous screening, and efforts to meet regulatory requirements integral to their operations. Aging drivers can’t work forever. The average age for all American workers is 42, but the average for truck drivers is 47. Replacing them will take even more investment and effort as they retire en masse during the coming years. Trucking has an image problem. Particularly among the tech-savvy, millennial generation, truck driving offers an unappealing lifestyle, which is bad news when the largest segment of the workforce sits squarely in that demographic. Further, because drivers must be 21 years of age to drive across state lines, carriers can’t compete for 18-year-olds who don’t choose college or the military after high school. By the time those workers turn 21, they’re already established in other careers that are less physically demanding with better pay. Truck driving doesn’t attract enough women.Women make up nearly half of the U.S. workforce but only 5.8 percent of the 3.4 million truck drivers on the road today. While more women are slowly getting behind the wheel, a lack of facilities and other accommodations, along with the job’s physicality and too much time away from family, put the career out of reach for many women. E-logs will cause some drivers to quit. Many drivers have threatened to leave trucking when the e-log mandate takes effect in December 2017 and over the two-year period during which the record-keeping requirements must take place. Older drivers in particular may find the learning curve too steep and look for less demanding careers, or retire altogether. Many working drivers don’t feel respected. Long hours on the road and a pay structure that doesn’t compensate drivers for dwell time are two big problems exacerbating the shortage issue today. While some carriers are making strides by raising pay levels and improving quality of life on the job, too many are not. Predicting the actual outcome of the truck driver shortage is no easy task because it’s influenced by numerous factors, from the economy and pay rates to workforce demographics and lifestyle. Regardless, some relief is on the way. Advanced systems and data analysis for fleet optimization are allowing carriers to accomplish more with fewer drivers. Employing such technology automates and reduces human error in processes such as rerouting around traffic, tracking and logging miles, and making safety-based decisions for drivers. Driverless trucks are also on the horizon and may well revolutionize the future of transportation by lowering costs, increasing safety, and allowing drivers to be more productive while a truck is on autopilot. And although plunging oil prices have kept freight rates low, they have also caused layoffs in the oil industry, bringing a wave of drivers with the right skillsets to the shipping industry. Regulatory changes underway could also ease the shortage. The Fixing America’s Surface Transportation Act (or FAST) is a 2015 bill before Congress which includes a pilot program that could enable veterans with military truck experience to obtain a commercial driving job. The bill also includes a study to collect data on the benefits and safety issues associated with allowing truck drivers under the age of 21 to work the interstate routes. 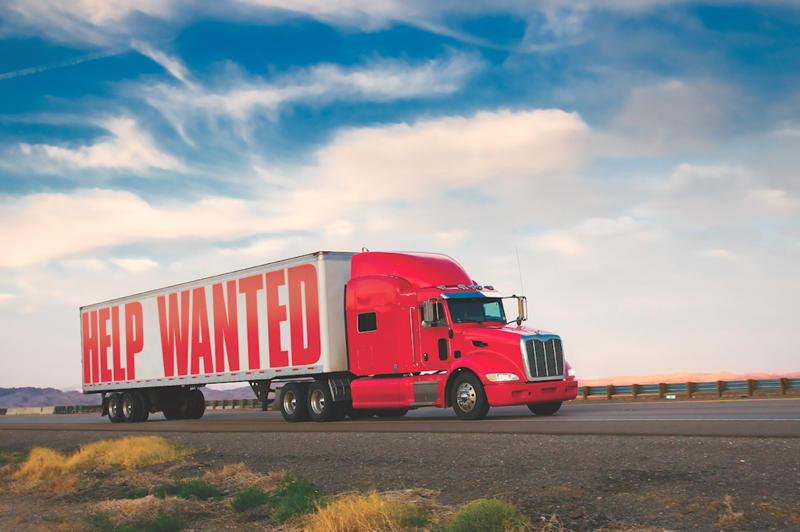 Shippers have a role in mitigating the driver shortage too. Avoiding driver dwell time at the facility, offering flexible shipping hours, and providing driver-friendly amenities are just a few ways to increase driver satisfaction and retention. Taking these and other steps to adopt a “shipper of choice” mentality can also make a shipper more attractive to carriers, strengthen partnerships, and improve the transportation industry as a whole—for drivers, carriers, shippers, and all members of your supply chain.